We’ve just received one of our last shipments of directly sourced 2014 vintage Red Burgundy and we are offering these new arrivals at a huge discount of 20% off the regular shelf price. Stop by the shop this Saturday to sample an assortment of these wines and stock up for the summer or the cellar. Mix and match as you please, minimum six bottle purchase to be eligible for discount. A domaine reborn. Domaine Heresztyn has been a family business since 1932 and although Florence Heresztyn had worked there for 13 years prior, 2012 marks the first vintage under the reorganized domaine that now belongs to Florence and her husband Simon Mazzini, a winemaker from Champagne who has worked at the domaine since 2003. They both began their influence in 2007 when they introduced whole bunch fermentation, which has become a fundamental principle at the domaine. Their approach in 13+ acres of vineyards spread across the villages of Gevrey-Chambertin, Morey-Saint-Denis, and Chambolle-Musigny is both lutte raisonnée and organic, depending on the plot, with the intention of going fully biodynamic. Declassified Gevrey-Chambertin from the “Champ Franc” climat and vines planted in 1986. Easy drinking and deliciously seductive. 430 cases produced. Assembled from a range of Gevrey-Chambertin climat including, Billard, Es Murots, La Platière, and Puits de la Barraque from vines as old as 70 years. Complex and highly elegant on the palate. 540 cases produced. From the Gevrey-Chambertin climat En Songe and Les Gueulepines with vines planted between 1926 and 1952. Great complexity along with nice freshness. 160 cases produced. From the Gevrey-Chambertin Premier Cru climat of “La Perrière” with vines planted in 1982. The finest of Heresztyn-Mazzini Gevrey Premiers Crus, elegant and harmonious. 150 cases produced. From the Gevrey-Chambertin Premier Cru climat of “Les Champonnets” with vines planted in 1972. Deep and dense with light floral notes and well-suited for aging. Less than 100 cases produced. From the Morey-Saint-Denis Premier Cru climat of “Les Millandes” with vines planted in 1972. Structure, elegance, with a complex bouquet. 150 cases produced. From the Grand Cru climat of Clos-Saint-Denis with vines planted in 1980. Rich, complex, and elegant – A great wine for the cellar. 80 cases produced. 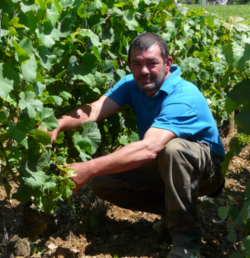 Richard Manière is third generation winemaker at his family’s 19 acre estate located in the village of Vosne Romanée. He cultivates his vineyards with the philosophy of “lutte raisonnée” (reasoned struggle) applying treatments with the overall health of the vineyard in mind. Indeed, all production methods used are for the goal of revealing the delicate purity of the terroir, including limited yields, hand-picking at harvest, traditional vinification, and elevage in barrel. These wines are ideal examples of superior terroir and excellent winemaking at value prices. Fixin is one of the most overlooked villages in Burgundy. A high quality Fixin is similar in character and structure to its neighbor to the south, Gevrey-Chambertin – robust, long-lived, and earthy. Vosne-Romanée’s glory lies in its remarkable blend of richness and perfume, vibrant fruit and a profound structure. From the Nuits-Saint-Georges Premier Cru climat of “Les Damodes” located in the northern part of the appellation, just to the south of the Premiers Crus appellations of Vosne-Romanée. From the Vosne-Romanée Premier Cru climat of “Les Suchots” that many claim to be the most noble of all the Vosne-Romanée Premiers Crus, in the best hands nearing Grand Cru in quality. From the Grand Cru climat of Échezeaux, one of the largest Grands Crus of the Côte d’Or and known for its approachability.